It was raining so we took Friday afternoon off to help out the Audubon Society with a black oystercatcher survey. I guess most people take a sunny afternoon off to go to the beach or something, but we live life a little out of the box. The black oystercatcher is a species of concern. 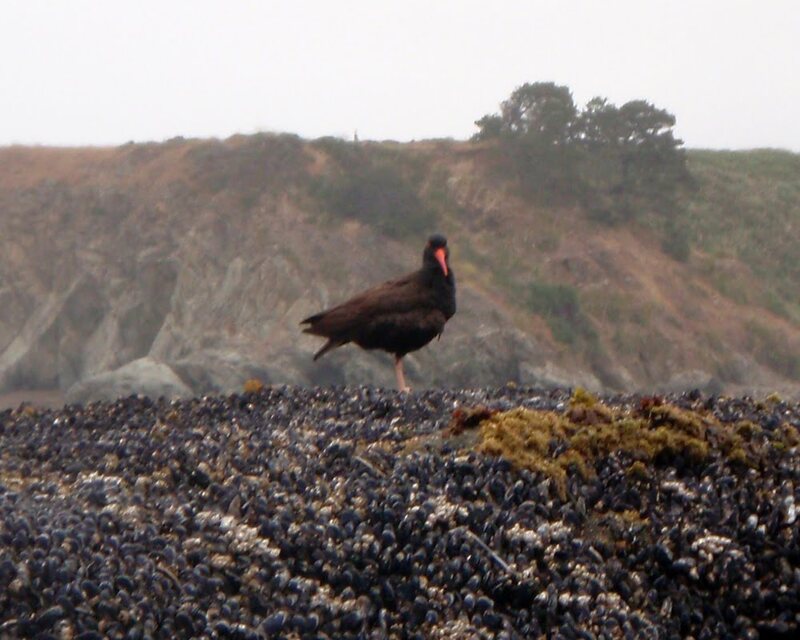 They are coastal birds that are almost prehistoric looking with their jet black bodies and bright red bills, pink legs, and glowing yellow eyes. They live on coastal rocks and feed on mollusks like mussels. 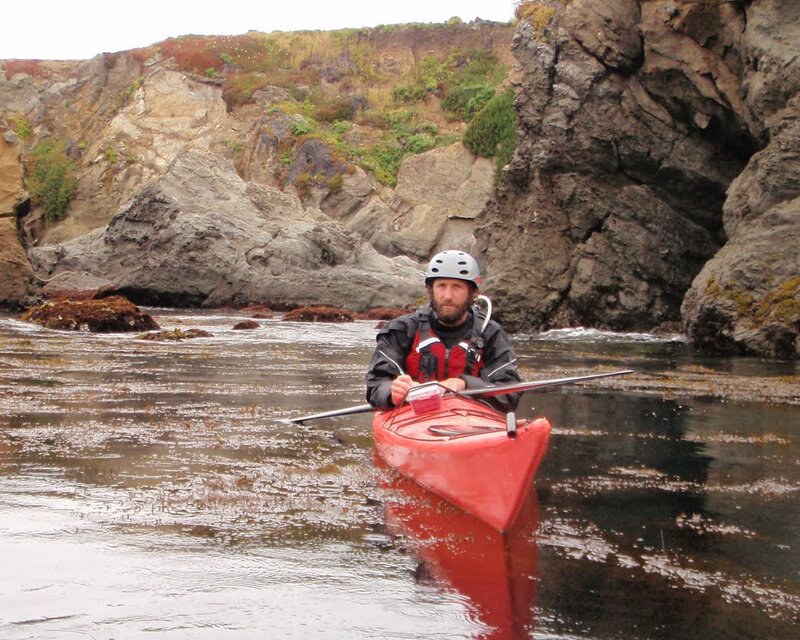 With lots of rocky reefs and coastal rocks, the Mendocino Coast is a prime habitat for them. 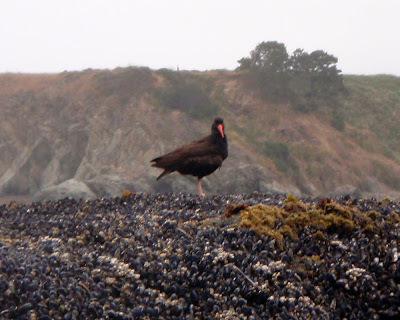 The California Audubon Society decided to organize a citizens in science project to survey the oystercatchers with special attention paid to nesting behaviors. 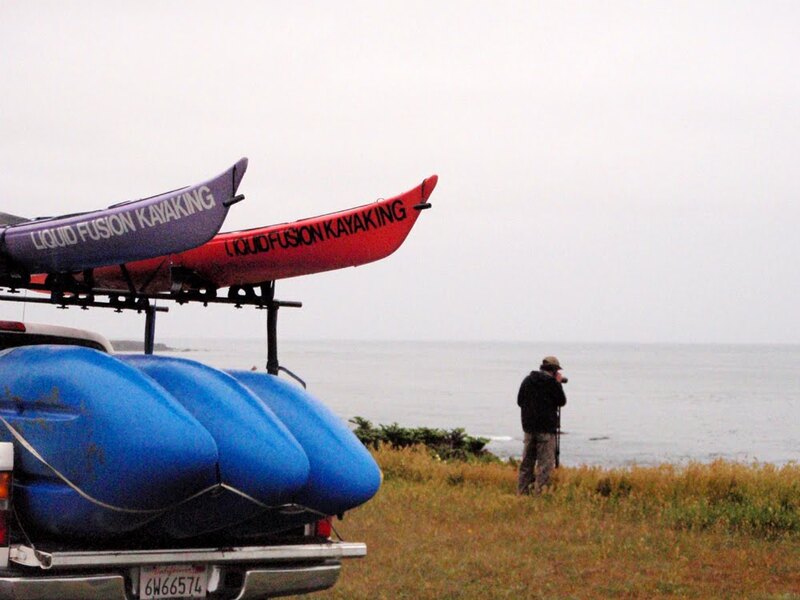 Of course kayaking is our favorite way to explore coastal rocks so we loaded up our sea kayaks and took them to Noyo Beach. Our survey area was Noyo Bay and the area just to the north and south to the southern headlands of Hare Creek. We had unbelievably calm ocean conditions. It was fun to meander through the rocky passages that are often inaccessible due to waves exploding through them. We had binoculars, our waterproof tablets, waterproof camera, and GPS. We found 4 nesting pairs of oystercatchers in our survey. We knew of 2 of the pairs from watching them over previous years. We also saw quite a few Western gulls and pelagic cormorants sitting on nests in our survey area. We saw a common raven nest with 3 young as well as a couple of common ravens raid a couple of cormorant nests. The ravens swooped in and scared the brooding parent off the nest and rifled through the contents of the nest. 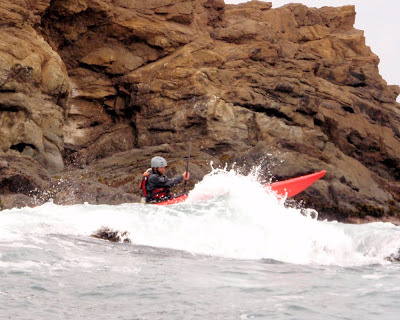 We haven't been out in our sea kayaks much so this was a great way to get some of the rust off our long boat skills before our June Tour de Mendo. 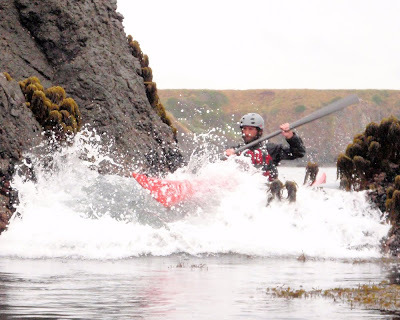 We used our greenland paddles because they are stealthy and quiet for wildlife watching. Of course we had to surf a couple of waves at Hare Creek and ride a couple of pour-overs and slots. I took advantage of the south swell for a fantastic ride over a wash rock with a gorgeous cascading backside (Of course - Jeff didn't have a camera). Here's Jeff coming over Nick's Nightmare. And Jeff blasting through Angie's Angst. After our paddle, we drove up to Pomo Bluffs with our spotting scope to scope out several of the nests that we had seen. 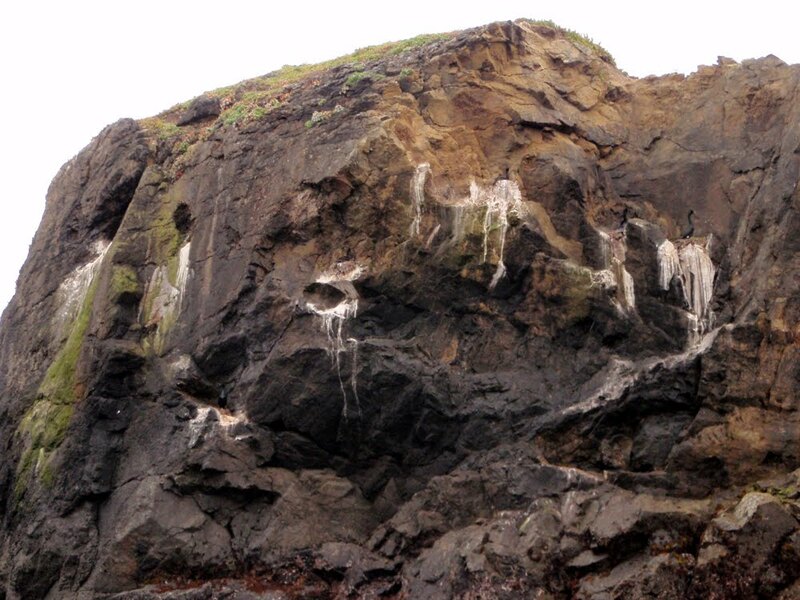 From on top of the headlands, we had a better vantage point to see the oystercatchers in their nests. 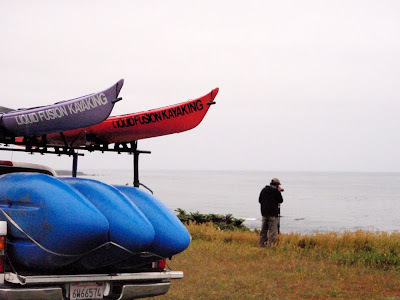 The Mendocino Coast Audubon had local birders covering most of the coastline during the 4 day survey period. It is great to see people rally to help out with these citizen science projects. We were happy to be able to help out with a portion. Nice photos! By kayak is the way to survey, it seems. There was so much I could not see from land on my survey. Cool blog. Cheers.